Eli Lilly and Co. stock jumped more than 3 percent as the company reported a 61 percent increase in fourth quarter earnings Tuesday. Shares of Eli Lilly were trading at $77.02 at the close of trading on Tuesday, up 3.1 percent. The Indianapolis-based pharmaceutical company reported a fourth quarter profit of $771.8 million, or 73 cents per diluted share, compared with $478.4 million, or 45 cents per diluted share, a year ago. Earnings adjusted to exclude the costs of products acquired from third parties and other items came to 95 cents per diluted share, 3 cents below analyst expectations. The company reported a strong pipeline of new drugs to treat cancer, diabetes, Alzheimer’s and other diseases, as well as partnerships with pharmaceutical companies Merck & Co. Inc. and AstraZeneca PLC to develop new products. “We continue to see the Lilly story centered on the company’s new product opportunities, which we see as supporting [more than 5 percent] top-line growth through 2020,” said JP Morgan analyst Chris Schott in a research note. 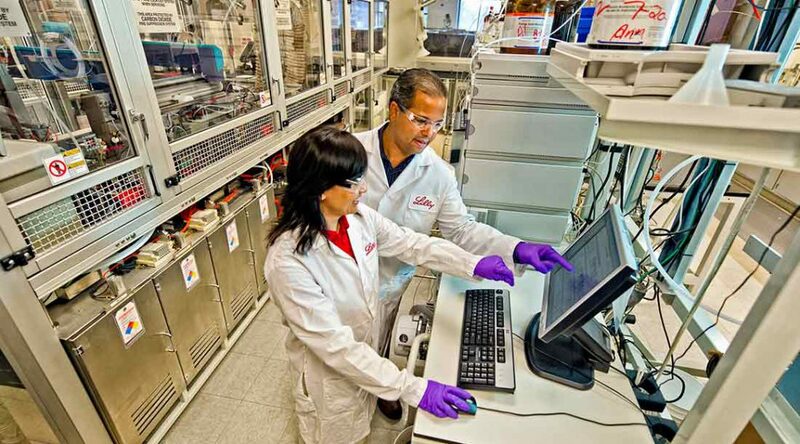 Eli Lilly’s strong pipeline is a key part of its long-term growth strategy, said Derica Rice, chief financial officer, in a conference call with investors following the earnings release. The company has launched seven new products in the last three years and has plans to launch three more in the next two years. “As we exit 2017, our growth prospects are coming into sharper focus. We have significant opportunity to drive growth over the balance of this decade from the product launches currently underway to three more new product launches possible through the end of 2018,” said Rice. Fourth quarter revenue grew to $5.76 billion, up 7 percent, buoyed by new pharmaceutical products including diabetes drug Trulicity and cancer treatment Cyramza. 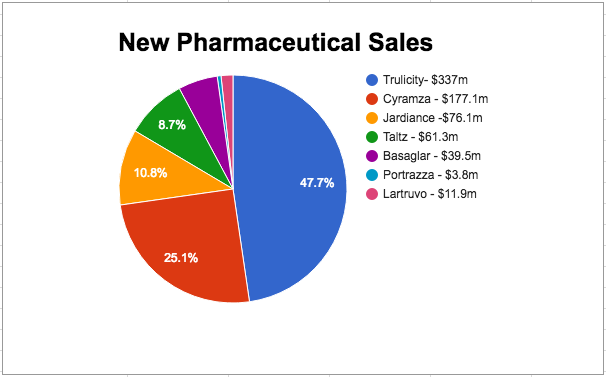 Together, Trulicity and Cyramza accounted for more than 72 percent of the $706.7 million in revenue generated from new pharmaceuticals. Cyramza posted disappointing U.S. sales due to competitive pressure. However, strong adoption in the Japanese market compensated for the meager U.S. results. Sales of Eli Lilly’s blockbuster insulin drug Humalog increased 3 percent from the previous-year period, raking in $819.8 million. This comes after a disappointing third quarter in which sales of Humalog fell 9 percent. The earnings announcement came on the heels of a Tuesday morning meeting between CEO David Ricks and President Donald Trump, in which they discussed tax reform, easing pharmaceutical regulations and drug pricing concerns. Ricks said that he and Trump touched on pricing concerns in their morning meeting but did not discuss any specific policy plans that would drive down drug costs. “I think we all understand the concern he’s raising and of course others are, that consumer out-of-pocket costs seem to be growing and growing faster than other payers in the system and how we can do a better job as an industry of getting discounts through to consumers, specifically those in high-deductible plans and government programs,” Ricks said. Eli Lilly has faced criticism for the price of Humalog. The price of insulin has more than doubled since 2011, the Wall Street Journal reported. In the fourth quarter, Eli Lilly announced a partnership with Express Scripts Holding Co. to allow those with no insurance or high deductible insurance plans to purchase insulin at up to 40 percent reduced price. For the year, Eli Lilly’s profit increased 14 percent to $2.74 billion, or $2.58 per diluted share, compared with $2.41 billion, or $2.26 per share, a year ago. Revenue increased 6 percent to $21.22 billion from $19.96 billion.